Wonder wine twin powers, activate! One of the highlights of this past weekend’s inaugural Santa Barbara Food & Wine Weekend was the “Meet the Masters Grand Dinner,” a decadent dinner which took place in Miro restaurant’s 12,000-bottle wine cellar in the Bacara Resort & Spa. (Typically wine-savvy restaurants have 500-bottle cellars.) 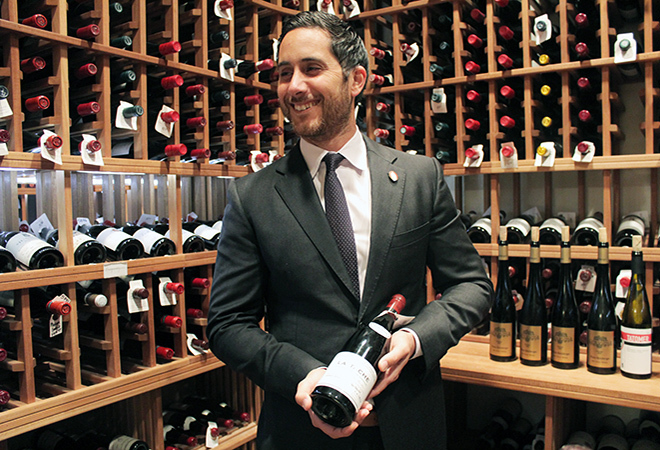 And master sommelier Brian McClintic didn’t just pair wine with the multiple courses, he did two flights of vino: a new world wine from Santa Barbara County with its Old World counterpart. Yeah, that dinner sold out. What’s the big deal? “Old world wines by design have compatibility with food in mind. It’s an extension of their culture,” said McClintic. “The producers featured here from Santa Barbara County represent a move in the new world to reflect that sentiment.” And these new world wines in particular emulate their old world mentors in their food-friendliness with lower alcohol levels, higher acidity, and restrained use of oak. To taste them side-by-side is a real treat for any oenophile. Here are McClintic’s pairings for the Masters Grand dinner (including a couple bonus ones) if you’d like to experience these for yourself. The master’s dinner series is on hold through the summer but will start up again in September, with an Italian duke no less, showcasing his Italian wines.